I am the current Chairman of the YCM Leaderboard. I am also the 2011 Co-King of Card Contests, a former CC mod, and the former Tournament Director for Yugioh 2099. I can usually be found in the Card Contests and 1v1, but I can also be found in both Casual and Advanced on occasion. I was one of the three founders of the Treehouse (formerly known as The Treehouse of Fun), so I have some ties to C/O as well. If you wish to talk to me, either PM or Skype me. If the latter, tell me who you are first. Member Title My Friends Are My Power! 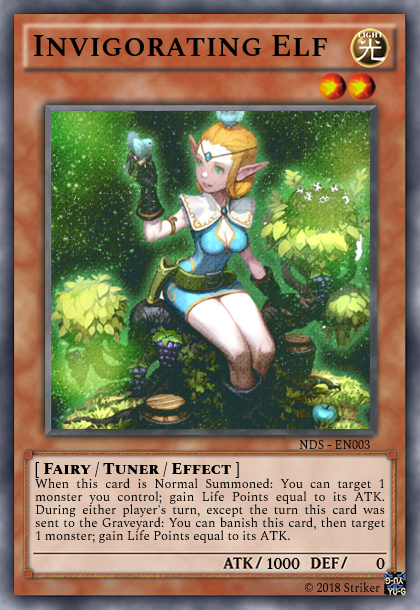 When this card is Normal Summoned: You can target 1 monster you control; gain Life Points equal to its ATK. During either player's turn, except the turn this card was sent to the Graveyard: You can banish this card, then target 1 monster; gain Life Points equal to its ATK. Yea, it's a simple Life Point gaining card (LP and GY still don't feel right btw); however, the second effect could prove very useful in surviving an opponent's onslaught. I can only see this used in Casual play, but I just couldn't get the idea out of my head and the image fits well. I thought about having it set to Summon instead of Normal Summon, but I decided against it. Anyway, CnC? PE: Once per turn: You can banish 1 Level 4 or lower LIGHT monster from your Graveyard; Special Summon 1 Level 4 or lower LIGHT monster from your hand or Deck. When this card is Synchro Summoned: You can target 1 banished LIGHT monster; shuffle it into your Deck, then draw 1 card. Once per turn, You can target 1 monster your opponent controls; banish that target face-up. This card cannot attack the turn this effect is activated. 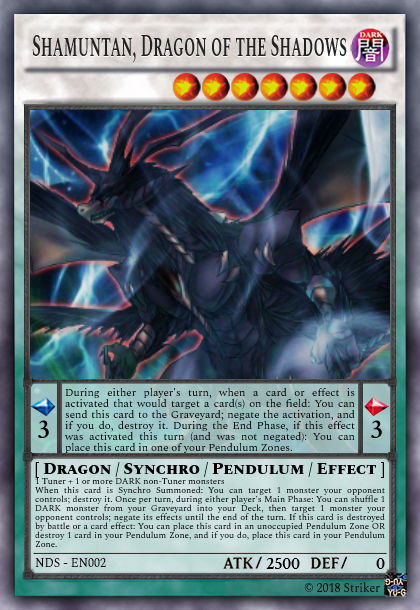 If this card in the Monster Zone is destroyed by battle or card effect: You can place this card in an unoccupied Pendulum Zone OR destroy 1 card in your Pendulum Zone, and if you do, place this card in your Pendulum Zone. PE: During either player's turn, when a card or effect is activated that would target a card(s) on the field: You can send this card to the Graveyard; negate the activation, and if you do, destroy it. During the End Phase, if this effect was activated this turn (and was not negated): You can place this card in one of your Pendulum Zones. 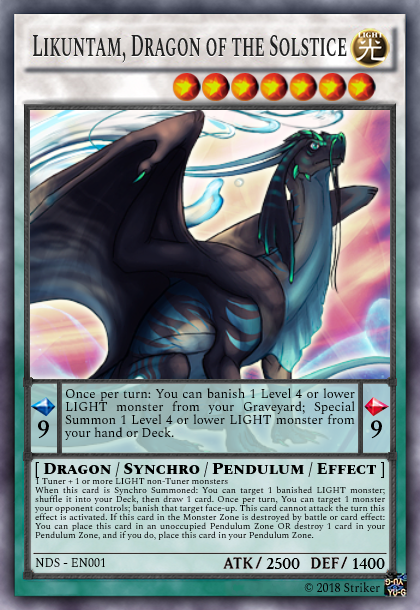 When this card is Synchro Summoned: You can target 1 monster your opponent controls; destroy it. Once per turn, during either player's Main Phase: You can shuffle 1 DARK monster from your Graveyard into your Deck, then target 1 monster your opponent controls; negate its effects until the end of the turn. 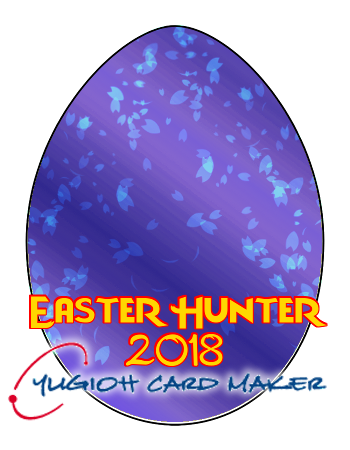 If this card is destroyed by battle or a card effect: You can place this card in an unoccupied Pendulum Zone OR destroy 1 card in your Pendulum Zone, and if you do, place this card in your Pendulum Zone. Reworked a couple of my 2015 cards. Brought them to Casual Cards in a new thread so I can ease my way back into action. For those that are curious, Likuntam has been severely reworked while Shamutan has been slightly reworked. Anyway, CnC and enjoy. Government shutdowns, once a rarity, are now becoming commonplace. For this one, I put the blame on President Trump. ...Trump backpedaled and reinstating his demands, which frustrated Senators who had gone home already for Christmas. This was especially true after the House passed a short-term funding bill with border wall funding. Since the two bills have yet to be reconciled, a shutdown starts in two and a half hours. So, what are your thoughts on this? What should be done? One of the points that Eric Bischoff made is that news these days is designed to make people feel, not think. When people feel, they are less likely to realize they are being manipulated for one purpose or another: professional wrestling is a classic example, which is great considering who is presenting. TBH, I agree with Eric Bischoff based on my own observations on Facebook and considering my own experience with the news. What do you think? Is News Media today taking pages out of the Professional Wrestling playbook as Eric Bischoff claims? Does feeling really hamper ones ability to think?